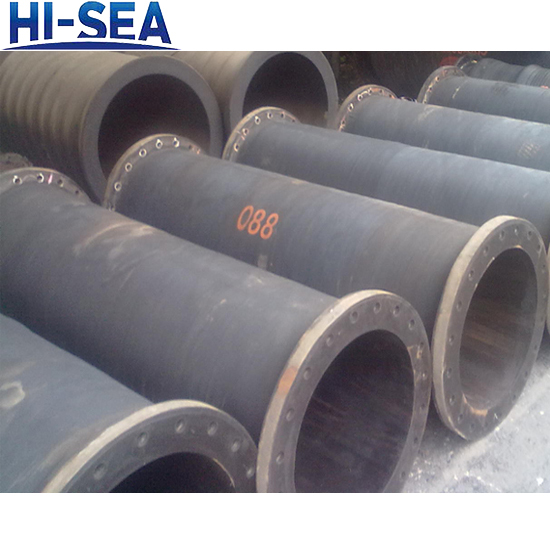 DN200 dredge discharge rubber hose is used to deliver and transfer mud and sand under working pressure.It is usually installed between steel pipes to make the pipeline more flexible. 1.Suitable working temperature:-20℃ to +50℃. 2.Convenient installation and flexible use. 3.Excellent abrasion-resistance and favorable bending resistance. 4.The product can be customized according to clients' requirements. 1.Cover:composed of natural rubber and synthetic rubber. 2.Reinforcement layer:composed of high strength rubber dipped chemical fiber and reinforced by spiral metal wire. 3.Inner rubber liner:composed of wear-proof natural rubber and synthetic rubber.